Not in terms of what it is, but what it could be. 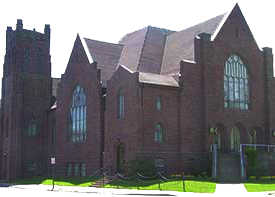 The Waverly United Methodist Church, as a congregation of The Upper New York Annual Conference of the United Methodist Church, has a mission, to make disciples of Jesus Christ, for the transformation of the world. Our vision, is to show God's love to our neighbors, at all times and in all places. The Waverly United Methodist Church, desires, to share God's grace, through God's redeeming love for humanity, in Jesus Christ. Learn about Know, Grow & Show.